It’s been nearly four years since I left New York, after fifteen years in Manhattan and close to seven in Brooklyn. For the first year or so I was making monthly trips back, partly for work and partly to ease the pangs of withdrawal. On these trips I found, as other ex-New Yorkers have, that I made better use of the city, in many ways, than I had when I lived there. My last neighborhood was Carroll Gardens. For several years, weather permitting, I had walked my son to his school on the edge of Park Slope, through Gowanus. We used to sometimes see a woman in a floppy hat standing by one of the bridges over the canal, painting at an easel. 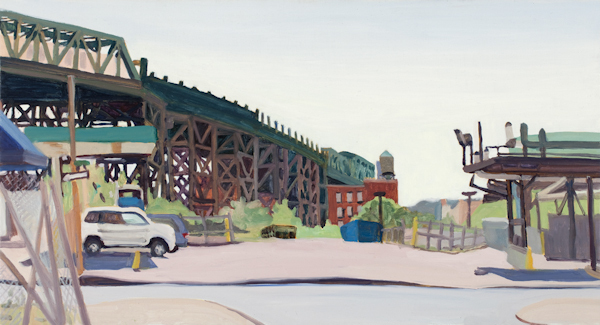 It was during the week, and she didn’t look like a Sunday painter anyway, nor were the banks of the Gowanus a place you would expect to find one. One thing I had never done enough of, not since my early years in New York, was go to galleries. On my trips back I started doing that again. I became aware of a number of contemporary painters of a more or less realist bent, seriously devoted to plein air painting, cityscapes, and other such long-unfashionable pursuits. Many of them exhibited at George Billis in Chelsea. I got a sort of crash course in all this from Maureen Mullarkey, herself a fine painter, whose website Studio Matters introduced a handful of them to me, and who told me about the centrality in this connection of the Spanish painter Antonio López García, whom I had not heard of before. So it was that I finally found out who the Gowanus painter was. It was Elizabeth O’Reilly, an Irish-born artist long resident in Brooklyn. I arranged to visit her studio, and was very much taken by everything I saw, from sketches and miniature collages to somewhat larger-scale watercolors and oils. The fact that many of the scenes she painted were so familiar – some of them literally “in my back yard” – didn’t hurt, but their appeal went beyond that (and she doesn’t only paint Brooklyn). The twentieth-century obsession with abstraction is still very present in the new cityscape art. It’s not something these artists choose to ignore. Their art is not naïve, though in a certain sense – a good one – you might at times be tempted to call it that. The industrial wasteland, the old panorama of urban decay, can have a surprising freshness. O’Reilly goes pretty far in that direction, while at the same time being among the most abstract, with drastically simplified shapes and large blocks of color cunningly arranged to give the very minimum necessary for identifying a scene, an object, or a place. I was reminded of Milton Avery, whose work I especially sought out in galleries when I first moved to New York. O’Reilly seemed to acknowledge the connection. His work, like hers, had often been called “lovely,” and not always in a complimentary way. One could certainly imagine that to the first Manhattan exiles, the homesteading hipsters who starting moving into the neighborhood in the seventies and eighties, not to mention to people born and bred there, these glowing, almost ethereal icons of their “mean streets,” the polluted waters and the decaying buildings, might seem a little unreal. But to one who lived in the neighborhood in the first decade of the twenty-first century, lived in it as it was then and not as it had been or as one remembered it, what they capture seems real enough. There was a kind of promise in the air, that had less to do with optimism or hopes for the future than with a simple recovery of the capacity to see. The old edge was not gone, but had receded a bit. Things didn’t look quite so stark or unequivocal. You were constantly being surprised with the wildest juxtapositions. It was no longer clear what era we were living in, or where it was all going. The flowers that peeked out from around rusting girders and crumbling concrete might carry a message of uplift, or they might have a more tangled meaning. Or none at all. On all such matters, O’Reilly’s art is endlessly suggestive, and perfectly laconic. And yes, it is lovely as well. For current or upcoming exhibits of Elizabeth O’Reilly’s work, check George Billis Gallery or the artist’s own website. You are currently browsing the Elizabeth O’Reilly category at Spoken and Sung.